By the beginning of the 1960’s Bruno Mathsson turned his attention to the possibilities of steel as a material in designing furniture. He was attracted to the possibility of creating new forms of resilient furniture combining lightness with good comfort. As with his bent laminated furniture he strived to minimise the amount of padding required allowing the form to provide the right level of support. 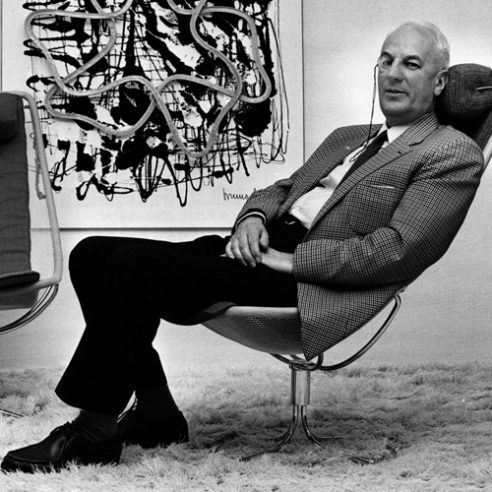 In 1965, inspired by the advent of the space age he designed an easy chair which he exhibited for the first time at an exhibition in Malmö a year later. The futurist appearance of Mathsson’s design gained the chair the nickname of Jetson after the American cartoon series “The Jetsons”. The chair was relaunched by Bruno Mathsson International in 2005 to the designers original specification as Jetson 66.